While drunken trees may sound like a joke, it’s not. There are drunken trees in Alaska, Canada, and Northern Europe. Trees should go straight up. 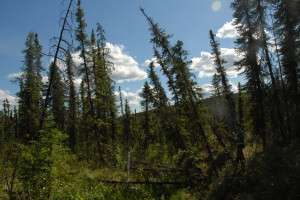 However, if the trees are in places with permafrost, and the permafrost melts, then the ground can collapse and the trees will end up tilted. This leads to trees that look like they are drunk. And it’s happening due to climate change. Other effects are erosion, and depressions in the land (thermokarst). Sometimes the trees can survive, but not always. Birch and black spruce are most affected because they have shallow root systems. It’s not just trees that are affected by this. It also affects animals in the ecosystem that depend on the trees for food or shelter. The depressions created can be big enough to swallow whole houses, which has happened. Families have had to move, roads have been destroyed, pipelines have cracked. And it’s only going to get worse as the global temperature continues to rise. This entry was posted in Science and tagged climate change, environment by Chris Riley. Bookmark the permalink.